The center column holds the main text for each day, while the right column includes secondary texts. Basic Tips:1.) Use a translation you can understand. If new to the Bible, try the NIrV or The Message, which are both available online. 2.) Use a kids Bible with kids. 3.) Keep a pencil and notebook around to write down questions, observations, and conclusions. 4.) Have fun. Use your imagination and your brain. 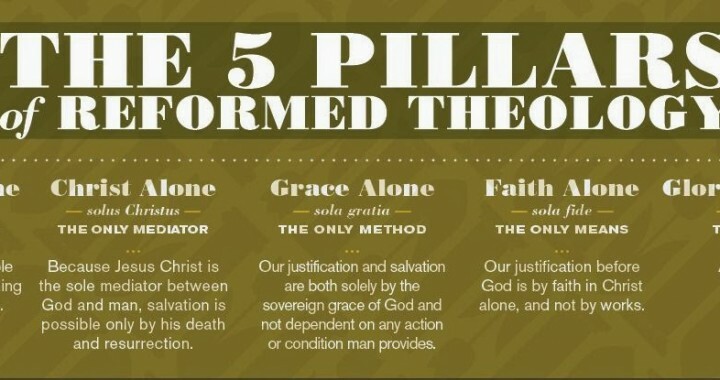 This week, we study “Soli Deo Gloria – Only for God’s Glory,” which says that while salvation benefits us, it and all things are ultimately about God’s glory or fame. The glory of God is the goal of all things. Matt 17:1-13 is oft called “The Transfiguration,” but Jesus is not being transformed into something he is not usually. Instead, Peter, James, and John are seeing Jesus as he actually is, in all his glory and splendor. How does that change the story? The spiritual/heavenly realm is all around us, we are just generally unaware, but sometimes the curtain is pulled back, like here, Luke 2:8-14, 2 Kings 6:8-17. How would seeing Jesus in all his glory affect you and your faith? What does the Father command Jesus’ disciples? Why? How can you do that? Rev 1 describes Jesus in all his heavenly splendor (it sounds funny because John is using words to describe the indescribable, and because our imaginations have been eroded by movie special effects) , how does it compare with Matt 17? Psalm 104, describes God’s glory. What does it mean that Jesus has God’s glory? What does Isaiah 42:8 tell us? What does it look like to give God’s glory to another? How do we rob God of glory/fame? How does God feel about his Glory? Why is it so important that God be glorified? We glorify something by enjoying it and sharing it with others. God is our greatest good and our greatest joy, and so we glorify God by enjoying God. The things we enjoy we talk about to others. 1 Cor 10:31 and 1 Peter 4:11 are applications for us. What would it look like to do al things for the glory of God? What does it man to eat and drink for God’s glory? How is God’s glory so all encompassing that it effects things as small as our diets. Ezekiel 20 is a Bible summary (up to that point). What is its refrain? What was God’s motivation for each action? Why did God withhold judgment? What is God most concerned with and what is the goal of all his actions in history? In Rom 9, Paul is showing how both those who receive mercy (are saved) and those who are judged (condemned) both result in God’s glory – some to the praise of his infinite mercy, others to the praise of his perfect justice. If you are new to reading the Bible and would benefit from a brief orientation, download this How To Use This Book. If you want dig a deeper into the Bible, download this Guide to Inductive Bible Study. 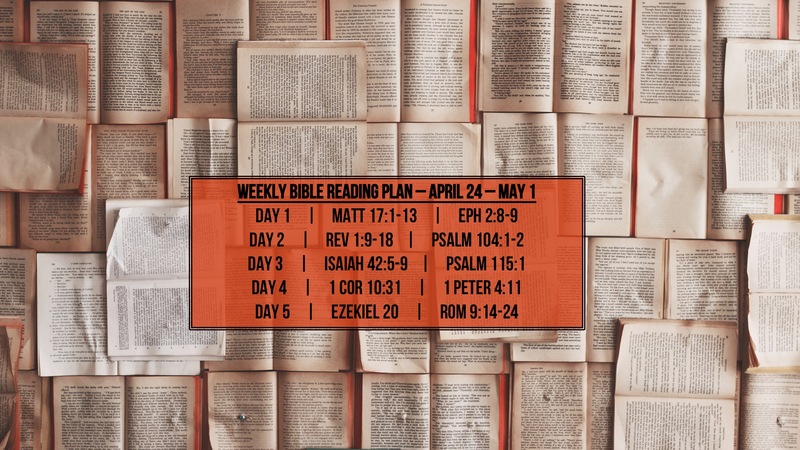 Posted in Weekly Bible Reading Plans and tagged Five Solae, Glorify God and Enjoy Him Forever, God Alone, Soli Deo Gloria, To God Be the Glory.